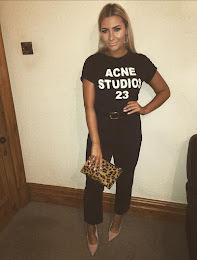 I get so jealous every time I scroll down my Insta-feed to see mega-babes looking absolutely smokin' with their flawless skin, nose highlight and fleeky brows which I can not seem to achieve through YouTube tutorials (ok so I've attempted it once, whatever) so I am going to admit defeat and book a 1-2-1 lesson with an MUA. I have already found the girl I want to learn from so I just need to pencil something in now. Which isn't Marbella. I wanna go somewhere faaaaar away, like Thailand (again) or Vegas. And if I end up booking too many mini-breaks this year (I've already booked Belfast and Amsterdam) I want to at least put the deposit down for a 2018 mega-break. I have worked with some pretty exciting brands recently, so I just need to keep up with the consistency of my blog, actually USE my brand spanking new Olympus Pen and do a little more networking! I love my job, and I think if you love your job you genuinely want to push yourself and get more responsibilities and recognition. So I'm in a good place! First I need to film them. Watch this space. I definitely caught the fitness bug last year. I stepped WAY out of my comfort zone and completed the Yorkshire Three Peaks, Born Survivor, Rough Runner AND a half marathon! All within 5 months! *dusts off shoulders* I really enjoy pushing myself to complete things I never dreamed would be possible for me, so I'm currently the look out for my next challenge! *swoons* If anyone is feeling generous I've linked the title straight to the product. DM me for my address. I hope you reach your goals this year! I want to save more money for holidays abroad and I am seriously considering taking a makeup course.